So I had this idea a few weeks back while looking through my commander decks to try and create a series of posts by everyone here at Minis and Meeples who plays magic to have each of us write an article about a pet card. 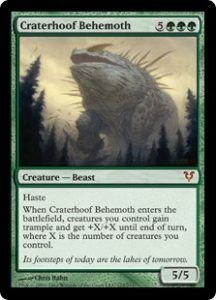 For those of you who are unfamiliar with a the term, a pet card is a card that a player uses quite often, or almost every time it is applicable, but it doesn’t necessarily have to be a good card. We’re not talking about like Reliquary Tower which is good in almost everything, although it can be a player’s pet card. 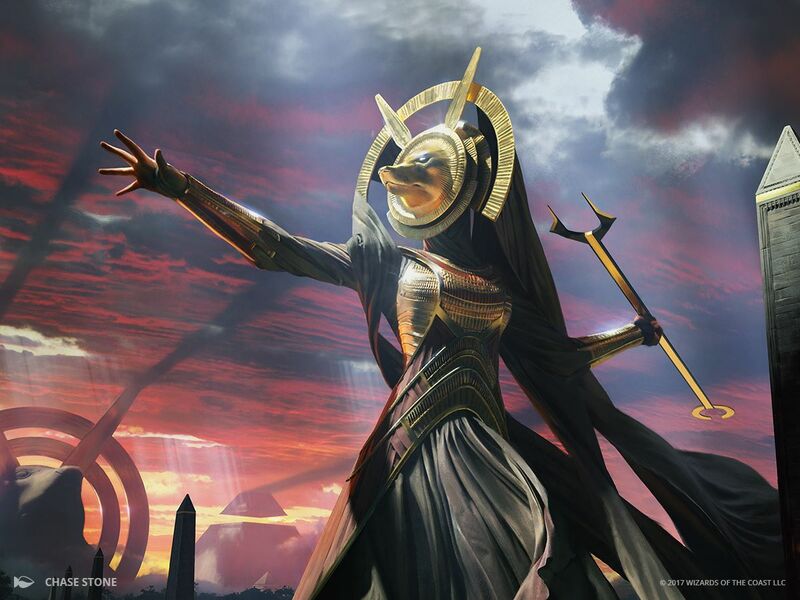 A pet card, played often enough or to great enough effect can become almost synonymous with a deck, or even a specific player within a play group. For the most part I only play commander, I have dabbled in modern a bit but mostly that was to kill free time on tuesday nights in McPherson. 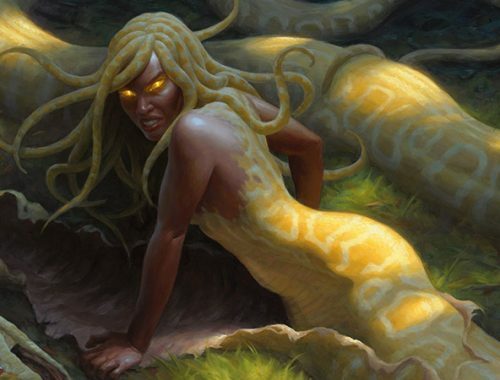 The idea actually came to me because while looking through my commander decks I kept finding one specific card in each deck no matter the archetype from burn, to spellslinger, to a tribal deck, since it has come out it has made it into every deck, and even every build I’ve done, (you know, like where you try to build a deck out, look at it’s interaction, get it all down on paper, and then never bother actually playing the deck or even buying the cards? No? Just me? Darn). breaking as say Deadeye Navigator, but it just has so much potential and appeal to my eye. Worst case scenario to me, is you equip it to a 1/1 chump and swing out, at least you’re getting even damage to each player, working on each of them. I understand people who question why I might try it in a spellslinger deck and the answer is twofold: 1. I am not one of those players who tries to super optimize their decks, which to many players will be code for “I am bad”, and 2. Guttersnipe. Most of my spell-based decks run a LOT of instants, so the idea is I go to combat and swing with snipe and trigger myriad, then before it moves beyond declare attackers step I’d dump whatever instants I have in my hand. In the average 4 player game that would make 8 damage to each opponent per spell, which in my opinion means you only have to have one instant to cast to make it worth the slot you’re giving up (because honestly if you’re a spell-based deck in red, you’re bringing guttersnipe even without the blade). Some players might say I’m dreaming, being entirely too optimistic, that I’m dreaming to look at it like that, but honestly Guttersnipe isn’t the only card in those decks I could use it with. Young Pyromancer. Faultgrinder. Firebrand Archer. Do I really need to go on? 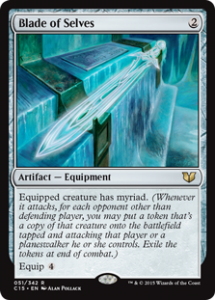 The point is even in non-creature decks there are a lot of fun ways you can use this card and get some milage out of it. Craterhoof is now at 2306 . Activating Rhys would make this ramp insane, I could have done my math wrong, but his total attack would be 2,361,602! That’s my kind of dream! God, I hate this card! been my bane since I first saw it played. Thragtusk. Luckily Thragtusk doesn’t have haste so you get a turn to kill it with fire. 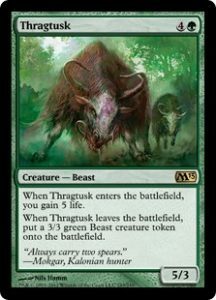 Again just Rhys and Thragtusk, when you go to attack you gain 5 life per tusk for 15 life, then Rhys can tap to make it 15 more life by doubling your tokens… and then at the end of combat you exile the copies of Thrag and get 6 3/3 tokens, and yes, I am going to expand on it just like I did for Craterhoof, because at this point you have come to expect it. Thrag attacks with all the same nasty token doublers that I mentioned before, 48 tokens gaining 240 life, Rhys taps and all that other stuff triggers for 1536 Thragtusk tokens, gaining 7680 more life, at this point you’ve gained 8020 life this turn, also you deal 80 to 3 opponents. Then because Thragtusk takes advantage of EVERY part of Blade of Selves, when the tokens begin exiling you get more tokens. For each of those 1536 tokens you get 48 3/3 beast tokens, leaving you with 24,576 tokens for NEXT turn… you know if you friends haven’t just given up yet. Of course for the 3rd time I might have set up the equation wrong, and my math might be off, but I’m willing to bet it’s near fatal. Even in the last 2 paragraphs I’ve been handicapping just how high my dream can climb with one basic assumption, that they’d only have 1 blade of selves. Granted this is where we’re going full on Alice in wonder land, but if they’d played this deck with Mirrorworks. They would have 17 blade of selves to equip to something as soon as they had enough mana, which since it was a dream anyway we could have done more math, but all the math I’ve done already has tired me out so if you want to go for it. Suddenly trying to get 8 damage per spell with a Guttersnipe isn’t such a pipe dream is it. Perhaps the real reason I love this card is because it prompts me to ask “what if?”, which honestly, isn’t that the real purpose of playing Commander, to challenge you to reach for the stars in your building? Now I’m sure some folks who comment are going to be cheeky and point to cards like Magister Sphinx or Fog or something that could bring any of my situations crumbling down, yes those cards exist, but I can’t keep going just to list all the ways this combo could fall apart, there are many of them, more than many probably. Is Blade of Selves a good card? Maybe. Is it a fun card? Abso-FREAKING-lutely! 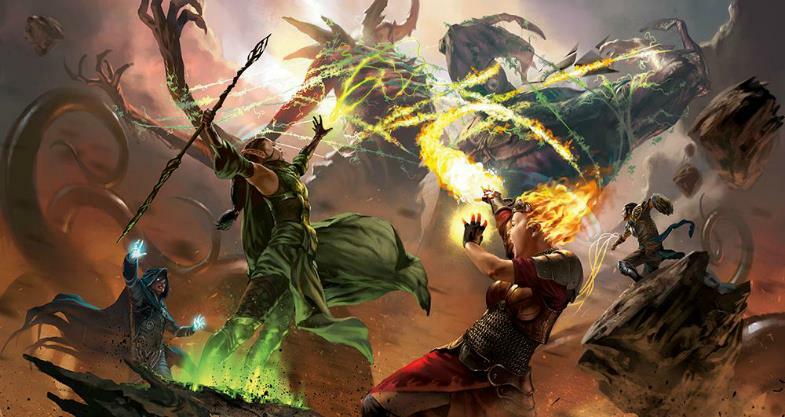 Thanks for joining me in what I hope will be an ongoing series of all of us here at Minis & Meeples gush about our most beloved cards from this wonderful game, Magic the Gathering. Brad has been playing tabletop RPGs off and on since the age of twelve and within the field of gaming he still holds the most passion for them. While he enjoys playing competitive games like Magic: the Gathering and Pokemon casually, his preference is in Co-op games like Sentinels of the Multiverse.